One of the true success stories of 2017, IT also marks that rare occasion when a Stephen King adaptation is done right. King's doorstop tome is split across two timelines, detailing the battle between a group of Derry, Maine children and the monstrous entity that is haunting them, primarily in the form of a hideous clown named Pennywise. The book later picks up with the Losers, as they're so named, later in life when they must do battle with Pennywise again. The first part of King's book has been brought to the screen with a great amount of sensitivity and compassion by director Andy Muschietti and screenwriter Gary Dauberman, who move the childrens' story from the 1950s to the 1980s without missing a beat. 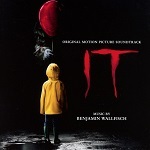 Featuring captivating performances from its young stars (particularly Stranger Things' Finn Wolfhard as the loudmouthed Richie) and a genuinely demonic Bill Skarsgard as Pennywise (who more than lives up to Tim Curry's earlier diabolical incarnation), it's a horror adventure that both moves and terrifies. The second instalment with the adult Losers is due in 2019. Previously Muschietti elicited a ripe score from Fernando Velazquez for his previous horror, Mama. Now he teams with British composer Benjamin Wallfisch and the results are truly impressive, the latter building on a run of recent, excellent horror soundtracks including Lights Out, A Cure for Wellness and Annabelle: Creation. Crucially Wallfisch has said he scored IT as a children's adventure story first and horror second, and the affection he feels for the characters shines through even in the midst of the horror material (of which there is plenty). This is a multi-stranded score with leitmotivic ideas applied to certain characters and situations. Chief among them is the theme for Pennywise himself, an adaptation of the archaic British nursery rhyme 'Oranges and Lemons' performed by a children's choir in a variety of different ways, from lilting lullabies (the start of 'Every 27 Years') to piercing, terrifying shrieks ('Time to Float'). The theme is designed to act as the monster's inner monologue, playing to his contradictory mixture of childlike glee and rampant evil. Occasionally the theme is deconstructed for twisted glockenspiel and strings as heard in 'Georgie, Meet Pennywise' and 'Come Join the Clown, Eds'. There is also an overarching piece for Derry itself, a somewhat melancholic and pensive idea that threatens to bloom into beauty but never quite gets there, held back by an underlying sense of darkness. 'Every 27 Years' (and its climactic reprise), 'Derry' and 'Derry History' allude musically to the terrifying stranglehold Pennywise has exerted over the town for centuries, the muted string section and woodwinds capturing the sense of unease in King's quintessential suburbia. Meanwhile the vast crescendos of '29 Neibolt Street' allude to the menacing dilapidated house around which Pennywise's evil pivots. The most attractive theme is almost certainly that for central Losers member Bill Denborough (Jaeden Lieberher) and his quest to find young brother Georgie, who becomes Pennywise's victim during the infamously terrifying drain scene at the start of the movie. Fluttering and piping away with childhood innocence in the opening 'Paper Boat' the piece weaves its way throughout the score to lovely effect in 'Georgie's Theme', 'Georgie Found' and, especially, the haunting and cathartic 'Yellow Raincoat'. Such melodic material helps ground the score's more overtly challenging moments, a reminder that this is a human story first and foremost, something that also arises in the theme for sole female Losers member Beverly (Sophia Lillis), whose theme is somewhat sparsely but effectively deployed in 'Beverly' and 'Haircut' before it blooms into a heavenly love theme between her and Bill in the climactic 'Kiss'. Fingers crossed that Wallfisch will be able to develop this theme further in Part II, assuming he's asked back. Talking of horror the score's eruptions are plentiful and ear-shattering, churning brass, racing strings and all manner of electronic and choral processing effects littering the likes of 'River Chase' 'Egg Boy', 'Hockstetter Attack', 'Into the Well' and 'Transformation'. Meanwhile the choir reaches truly gargantuan proportions in the likes of 'Pennywise's Tower' as the clown's reign of terror becomes truly apparent, just as it does with the chilling choral groans and wails of 'Deadlights', capturing Pennywise's ancient evil essence. Towards the end of the score the action really begins to ramp up in the hugely dramatic 'Feed on Your Fear' and 'Welcome to the Losers' Club', fully embodying the heroic climactic battle as the kids fight back against Pennywise. Georgie's theme is then capped off in the stunning 'Blood Oath' before the summary reprise of 'Every 27 Years' leaves us with a slight feel of unease, a reminder that Pennywise's evil has only been temporarily stopped. There's one more creepy delight at the very end of the album in 'The Pennywise Dance', a twisted wurlitzer that sounds like a carnival from hell that brilliantly captures the maniacal energy of Skarsgard's excellent performance. There's no denying that a great deal of the IT score is a brutal and challenging listening experience, as it should be. After all this is a story dealing with that most chilling of monsters, a killer clown. 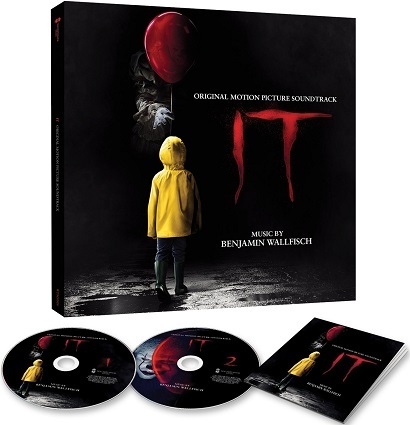 Yet the way Benjamin Wallfisch balances this intentionally unpleasant sound with a great deal of innocent and more melodic material that leavens the score, adding to a rich and intelligent experience that communicates Stephen King's themes very effectively. Plus, with its inventive musical ideas, not least of which is the application of a British nursery rhyme to a wholesome American setting, and what we have is one of the most effective horror scores in years. Benjamin Wallfisch's score album (O.S.T.) for IT is available from these links at Amazon.com and Amazon.co.uk.